This post may contain affiliate links. The full affiliate disclosure appears at the bottom of this page. I’ve been growing celery in the garden for a few years now, and it has become one of my favorite garden vegetables. It grows all summer long and into the fall, and you can harvest just a few stalks at a time – it keeps sending up new shoots to replace those that are removed. 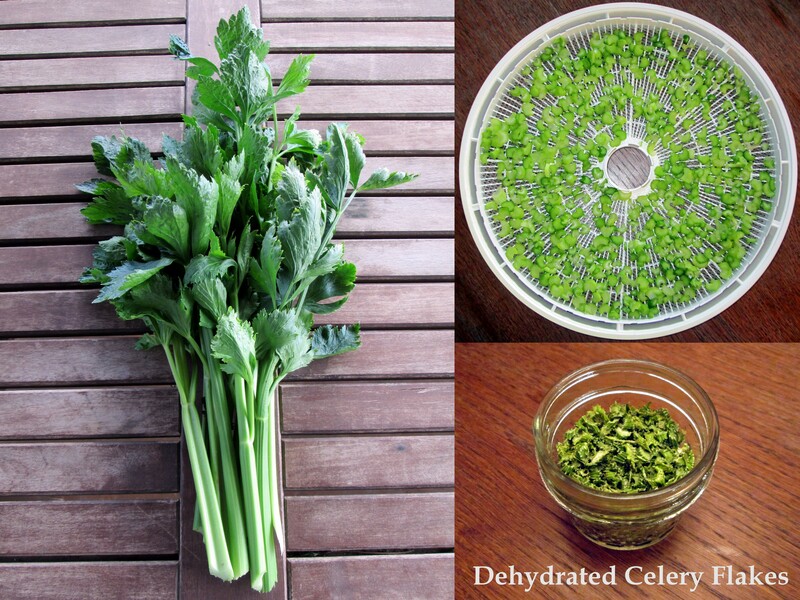 A continuous supply of celery is much appreciated in my kitchen, where I use a lot of it. Like its cousin parsley, celery has a lot of flavor. It combines with carrot and onion to create the classic mirepoix blend, which I use liberally in most savory dishes. I use celery to flavor soups, sauces, and even chili. 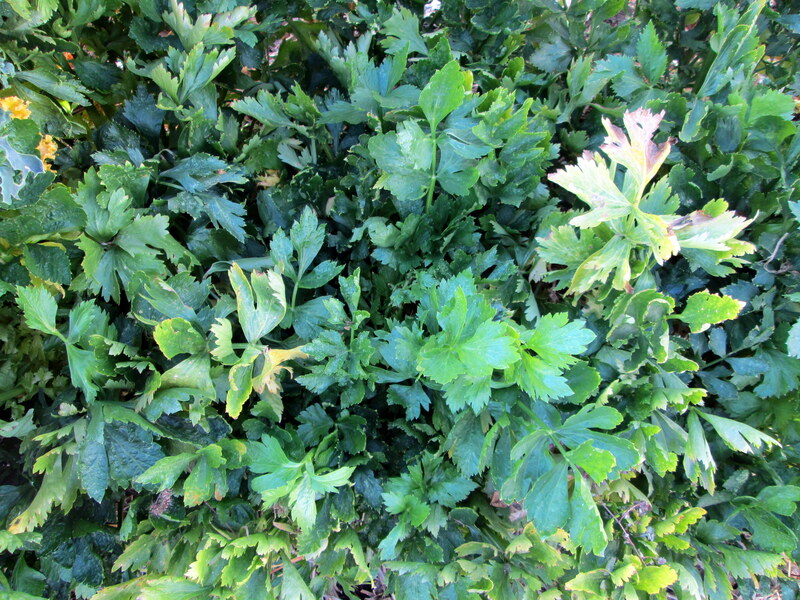 In past years, a hard freeze meant the end to my fresh celery supply and a trip to the compost pile for the remaining plants. But not this year. 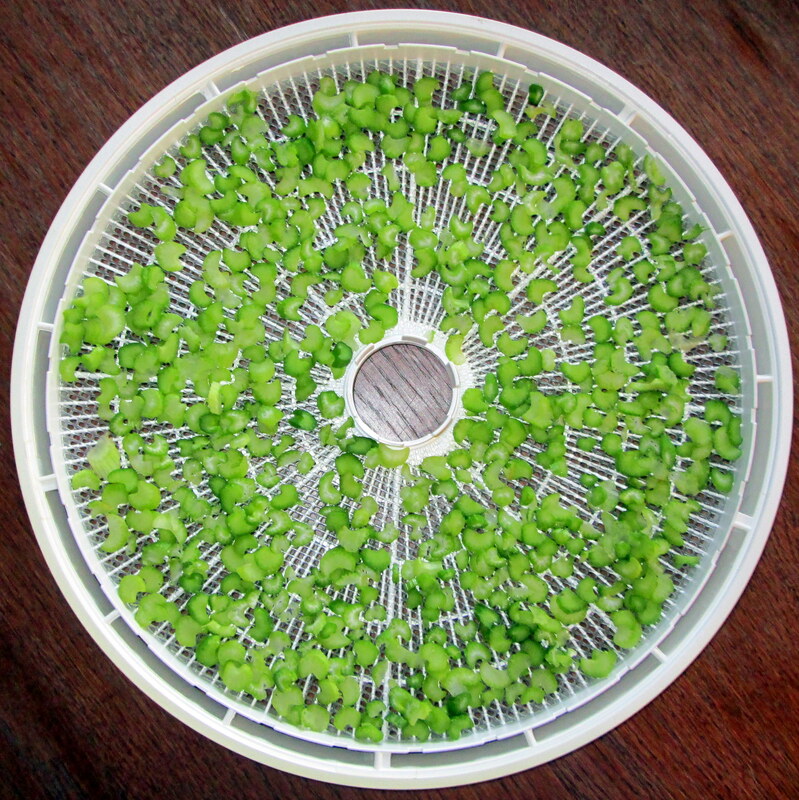 I realized I could be using our food dehydrator to preserve the celery for use throughout the winter in the form dried celery flakes. And, as it turned out, the process couldn’t be simpler. In addition to a food dehydrator like the Nesco Gardenmaster I got Bob for Christmas a few years ago, the other tool that makes this task so easy is another item no vegetable gardener’s kitchen should be without: a mandolin. 1. Wash and drain 6-10 stalks of celery. Trim the bottoms of the stalks but keep the leafy end intact. 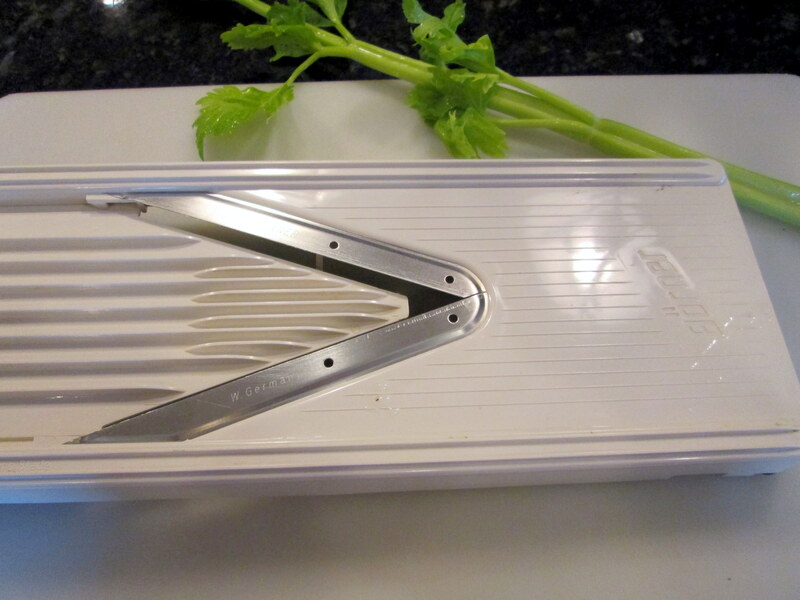 It will be your handle when slicing the celery. 4. 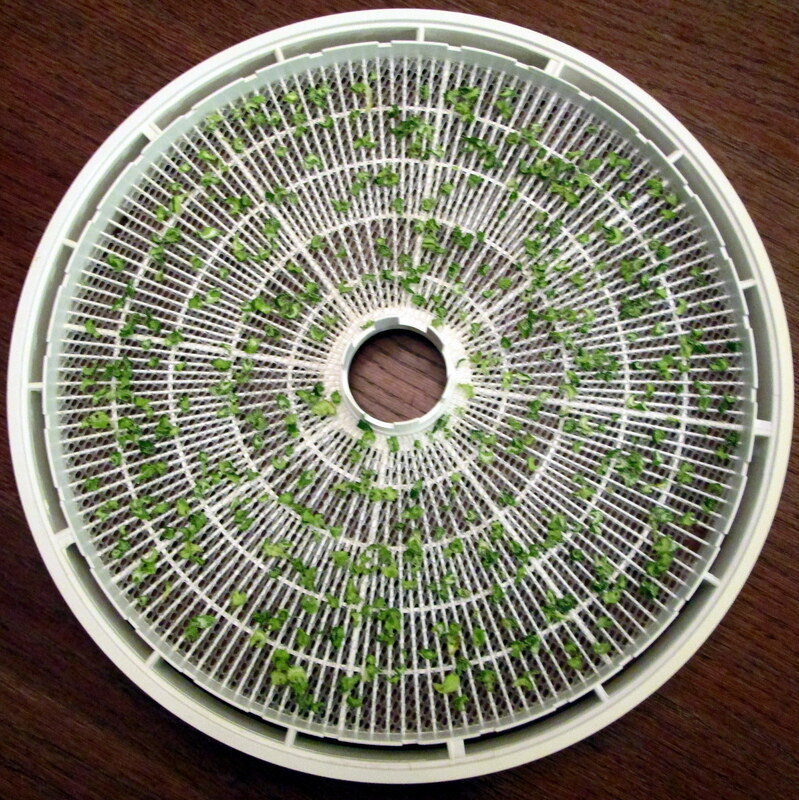 Set the dehydrator at 95°F (35°C) and dry for 24-48 hours. 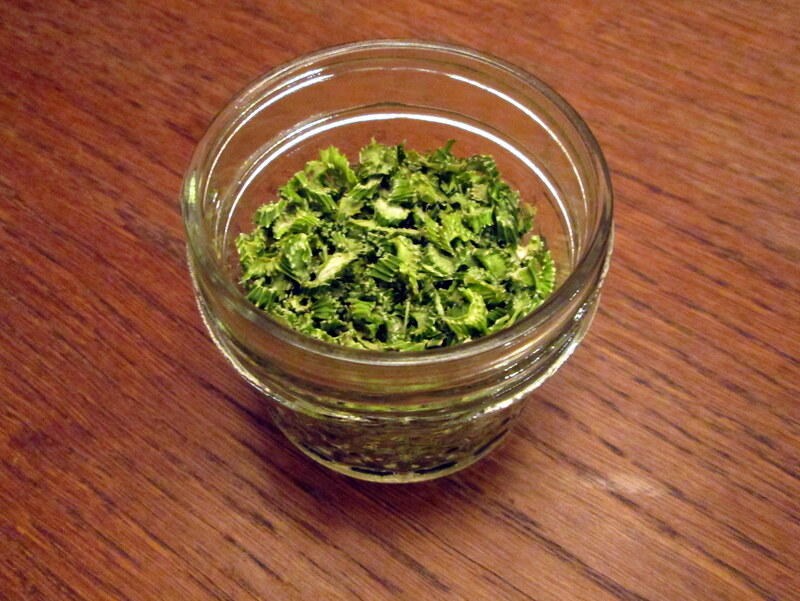 Store the dried celery flakes in a sealed glass jar in a cool, dark place. Use them to season in soups, stews and sauces. They will rehydrate during the normal cooking time. This entry was posted in Preserving the Harvest by Deborah Neyens. Bookmark the permalink.